Originally orange, Doug Haring's Rickman Metisse looks deadly in black. It powered the fastest standard Royal Enfield built before the company went out of business in Britain, but the Series 2 Interceptor motor didn't bow out when Royal Enfield closed down in Redditch. Motorcycle entrepreneur and promoter Floyd Clymer saw potential in the 750cc twin — potential untapped before Royal Enfield closed its doors amid the collapse of the motorcycle industry in Britain. 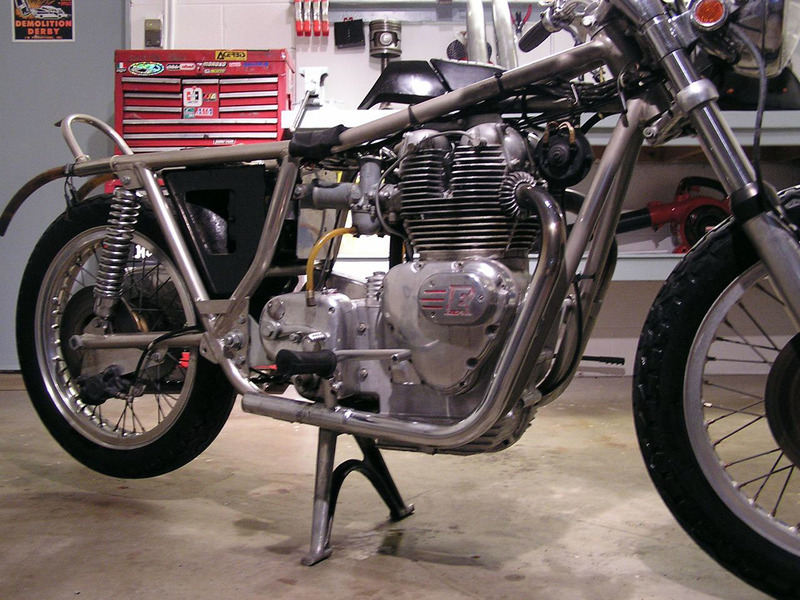 In turn, Clymer's hopes to put the mighty Royal Enfield motor into a dashing Italian frame were interrupted by his death in 1970. Few "Clymer Interceptors" were built. 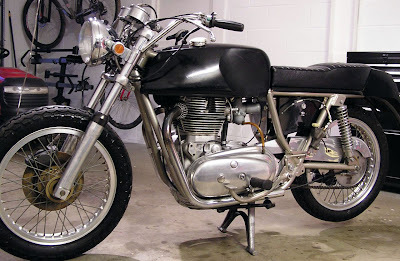 His remaining cache of Interceptor motors went to the Rickman Brothers, who fashioned a modern frame around the Royal Enfield twin. The Rickman Metisse was the result, a very rare prize, with only 137 and some prototypes built according to Burton Bike Bits. Starting in 1970, production continued for less than two full years. "I have a 1972 just like this. Only 3,500 miles. Needs a little work to get going again. Fiberglass has been painted black. Other than that it's original. "The bike was my dad's and I picked it up at the airport with him... The bike was imported from Canada. It has not been ridden since the late '70s and he just gave it to me as a gift. "It is a complete bike but not completely together in these photos. I do have the original shocks as well as the nicer ones in the pics." 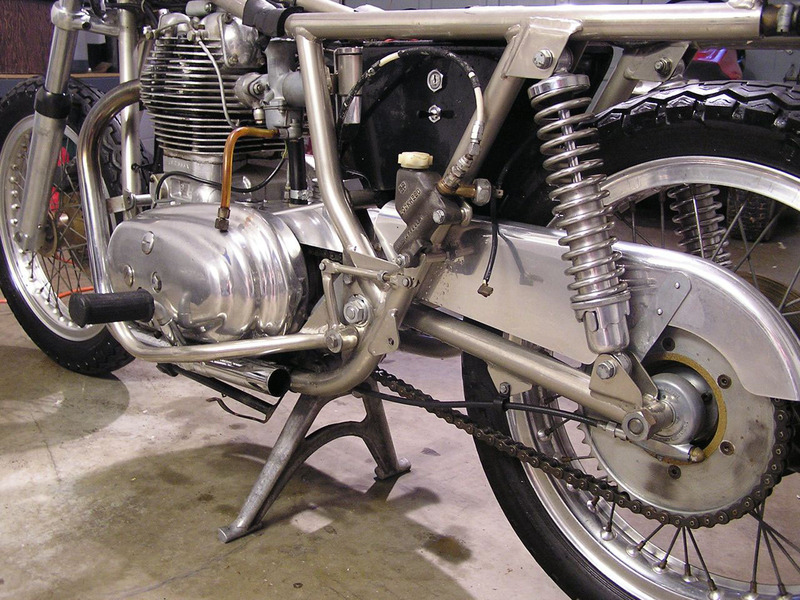 Rickman frame took the Series 2 motor into a future the Interceptor never knew. Besides its rarity, the Metisse is valued for its improved frame and forks and light weight compared to the Royal Enfield Interceptor. 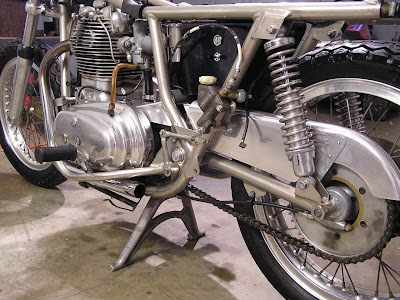 The foot pegs welded to the exhaust pipes instantly identify the Rickman. With collector interest intense, there's always attention paid when a new one emerges. Doug provided the serial numbers from his bike to Graham Scarth, chairman of the Royal Enfield Owner's Club in the UK. The club possesses what factory records remain, but many gaps exists. Clean design, foot pegs on exhaust pipes mark the Rickman Metisse. As it happens, Doug was able to provide the club with even more Rickman information: a 1973 invoice for "Rickman Street Metisse Motorcycles" purchased by Chariot Cycles Ltd. of Winnipeg, Canada, importers of his father's Metisse. The document "has just reduced the number of frames for which we had no engine number from 14 to seven, as well as accounting for 13 of the spare engines," Graham wrote Doug. The 40-year-old typed invoice did contain a few apparent typos that leave some mysteries intact. "Notwithstanding the typos, the information in this document is of incredible value to the Club and I am most grateful to you for sharing it with us," Graham wrote Doug. "I will be forwarding copies to our Archivist and Dating Officer." Doug can be sure now that his father's Metisse will live on forever in the history books, a fond memory. "When I was six years old, I remember riding to the airport with my dad to pick up the crate. We opened the crate at home and it was the coolest thing I ever saw," Doug wrote me.